Lingmoor Fell sits in a splendid location, dividing Great Langdale and Little Langdale, and with great views into both valleys. The summit is also one of the best viewpoints for the Langdale Pikes, seen face on and with a rare clear view of Stickle Ghyll. Underfoot Lingmoor Fell is typical of the lower stretches of the Langdale fells, with a lovely mix of undulating slopes and rocky outcroppings - always interesting underfoot, although with a slightly frustrating tendency to false summits and unexpected dips in the path! At the north-western end of the fell is Side Pike, easily climbed from the west, but an impassible barrier from other directions. The Pike thus has to be visited as a diversion from the main walk, or as a small walk in its own right. Lingmoor Fell can be climbed from the Elterwater end, from Little Langdale hamlet or from the Blea Tarn end. From Blea Tarn one path runs north from the road just south-east of Side Pike until it reaches the ridge line, then turns right. One path runs all the way up to the summit, with a side branch off to Lingmoor Tarn. From Bleatarn House a path runs south-east alongside a beck, running underneath the summit and joins the path up from Little Langdale. From Little Langdale head up the side-road to Dale End, then along the track until a footpath leaves to the left. This crosses a couple of fields then another path branches off right to climb up the steep side of the fell. At the top of this climb the path turns left and runs up the main ridge of the fell. Just short of the summit there is a final climb up Brown How and the summit is on the northern side of the summit wall. From Elterwater the route runs up tracks through Baysbrown Wood and Banks Quarry, runs up to the disused Lingmoor Quarry, and then joins the Little Langdale path. 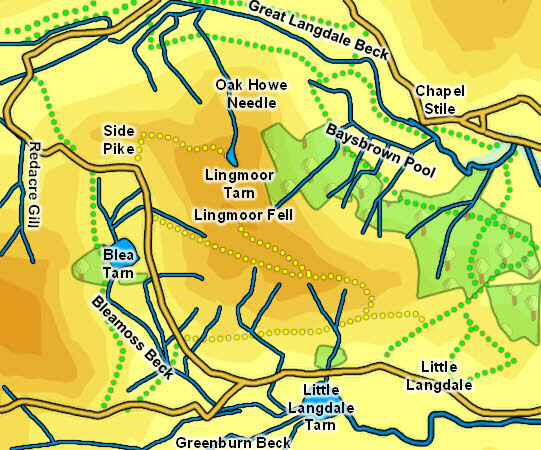 We have an ascent of Lingmoor Fell from Little Langdale. The summit is a small rocky outcrop on a grassy dome at the top of Brown How, a final climb on top of the main fell. This is a splendid viewpoint for the fells around the Langdales, but the only distant views are to the east, out of the valleys. The western boundary is formed by the feeder streams of Blea Tarn then by Bleamoss Beck as it flows south into Little Langdale. This then joins the River Brathay, which forms the southern boundary. The eastern border of the fell roughly follows a road that runs from Little Langdale hamlet to Dale End farm and then across the fells as a track to Elterwater village. A nameless stream runs south along a similar line to flow into the the Brathay, and another nameless beck runs east from the track, flowing into Elterwater lake. The northern boundary is formed by Great Langdale Beck, which flows past the fell and into Elterwater. Lingmore Fell can thus claim a short footing on that lake. Lingmoor Fell has one named tarn of its own and a half share in two more. Lingmoor Tarn sits on the northern slopes of the fell, and is best reached from the upper reaches of Great Langdale. Little Langdale Tarn sits just below the road in Little Langdale, but sits a frustrating distance from the footpaths in the valley. The most attractive of the three is Blea Tarn, in a valley that links Little Langdale and Great Langdale. Lingmoor Fell contains a number of quarries, mainly disused, but there is still one working quarry at the north-eastern corner.